We suspect he’s right. That’s why we’re suggesting a contrarian code so we can laugh the whole concept off into the sunset. Thanks to some straight-shooting suggestions from MTC and Scatter’s own chief correspondent, Martha Ullman West, here’s our new, improved, Oregon Code o’ the West. Feel free to add to it or shout it down. Plus, if it passes, we promise not to sell any merchandise whatsoever to go with it. Not even a state user’s fee, often known on some ranches we’re aware of as a Democrat Sneak-a-Tax. Never drink unless you’re alone or with somebody. Call this the Cat Ballou clause. Thanks, MTC. This does sound like a Rule #1. Don’t make a mess in your own bunkhouse. It’s the only West we’ve got. Don’t trash the place. Admire that big horse, son, but saddle the small one. Be respectful around the womenfolk. You’re not the boss of them. Considering that on the average homestead they had the kids, raised the kids, maybe even died while birthin’ the kids, did the cooking and cleaning, kept the books and generally ran the family business, by rights they ought to be the boss of you. Before cussin’ your boss, saddle your horse. White don’t necessarily make right. Contrary to certain claims of exclusivity, the True West is a place for all sorts of folks. Indians (they were here first). Mexicans (ditto). The Chinese who built the railroads, the Japanese who tilled the soil, the black men and their families who came looking for a fresh start. The West belongs to all of us. Better yet, we belong to it. Respect the other riders of the range. Animals. Fish. Plants. They live here, too. They got rights. Sometimes you get, and sometimes you get got. Especially if you don’t fold ’em when you ought. Defend and obey the rights of the Commons. We’re all in this together, so don’t get greedy. Help your cowpoke neighbor as yourself. Ain’t no such thing as a lone ranger. When someone needs it, lend a helping hand. Could be the other way around next time. Holster that six-shooter. For god’s sake, can we please try to talk first and maybe not shoot at all? Stop and smell the sagebrush. What’s the point of living here if you don’t pay attention to the beauty of it all? 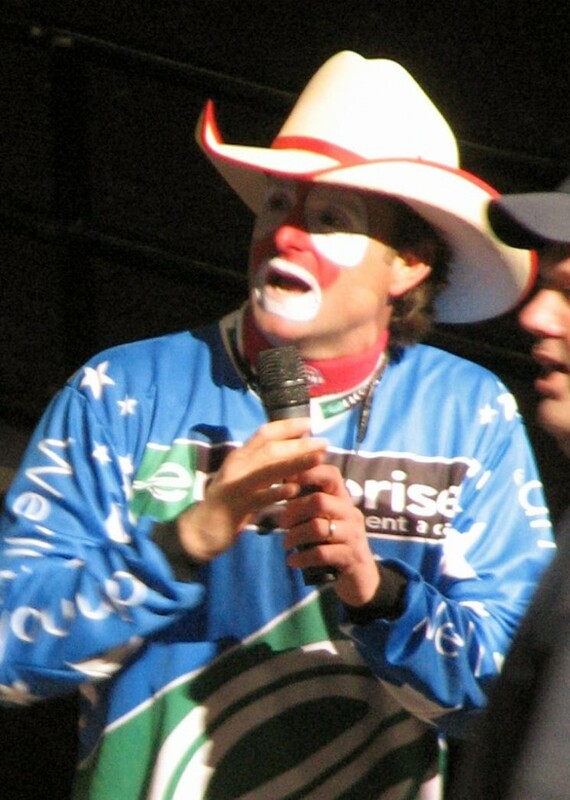 PICTURED: Rodeo clown Flint Rasmussen, April 14, 2007. Photo: Dave Hogg/Wikimedia Commons.